Fast ELISA kit now available: Boster is proud to announce the newest Picokine Fast ELISA kits. Now you can perform what used to be 4+ hour ELISA assay in under 1.5 hours. 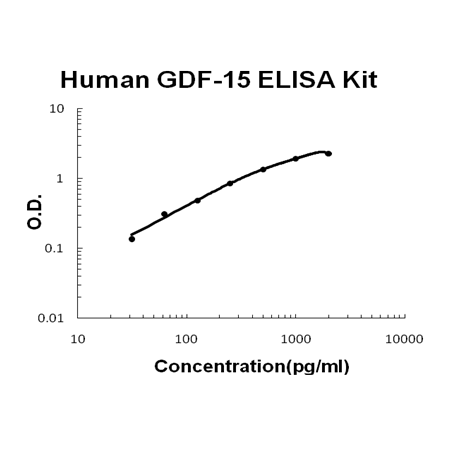 Available for Human GDF-15 PicoKine™ Fast ELISA Kit and many others. Sandwich High Sensitivity ELISA kit for Quantitative Detection of Human GDF-15. 96wells/kit, with removable strips. Highly expressed in placenta, with lower levels in prostate and colon and some expression in kidney. GDF-15(Growth differentiation factor 15),also known as TGF-PL, MIC-1, PDF, PLAB, and PTGFB, is a protein belonging to the transforming growth factor beta superfamily that has a role in regulating inflammatory and apoptotic pathways in injured tissues and during disease processes. Using FISH, the MIC1 gene is mapped to 19p13.2-p13.1. Its expression in liver can be significantly up-regulated in during injury of organs such as liver, kidney, heart and lung. GDF15 showed increased expression and secretion during erythroblast maturation. GDF15 functions as an antiinflammatory cytokine by directly interfering with chemokine signaling and integrin activation.